Tooth contouring or reshaping is a cosmetic dental procedure also referred to as odontoplasty, stripping or slenderizing. It is also known as enameloplasty since it involves removing small amounts of the tooth’s enamel to alter the appearance of its shape, length or surface. Tooth contouring and reshaping can fix a range of dental issues including chipped, cracked or crooked teeth. Who Benefits from Tooth Contouring and Reshaping? Tooth contouring and reshaping fixes minor imperfections in most patients while providing an improved smile and better oral hygiene. Patients who want straighter and more evenly shaped teeth can benefit by trimming slightly overlapping teeth, reducing the length of a tooth and correcting irregularly shaped teeth. Patients with bumps or pits in the enamel, as well as patients with overlapping teeth, can improve their overall dental health with tooth contouring as it also addresses plaque and tartar in these areas. Tooth contouring is limited to minor aesthetics since removing too much enamel can cause the teeth to become weak. Patients with a thin enamel layer may not be good candidates for this procedure. These patients may be better candidates for another procedure such as bonding or veneers. How Is Contouring and Reshaping Performed? An initial exam will be necessary to determine if the patient is an ideal candidate. The dentist will take X-rays to determine the size and location of the tooth’s pulp. If the teeth are healthy enough, and fit the criteria, the dentist will schedule the treatment. Tooth contouring and reshaping can take as little as 30 minutes depending on the amount of work needed. The dentist will mark the teeth with a pencil or pen to highlight the areas which need sculptured. Since the enamel is mostly made up of minerals, and there are no underlying blood vessels or nerves, there is no feeling in this layer. Therefore, no pain medications or numbing agents are necessary. The dentist uses several tools, such as a sanding drill with a fine diamond bur or a laser, to gradually remove small amounts of surface enamel. Fractured or chipped teeth are smoothed out and specific edges are rounded or squared. Abrasive strips are used between the teeth to shape and smooth the sides. After the bite is checked for proper alignment, the dentist will smooth and polish the teeth. The results provide the patient with a more uniform appearance and less crowded teeth. Patients can maintain the results by brushing at least twice a day, flossing daily and maintaining regular dental checkups. 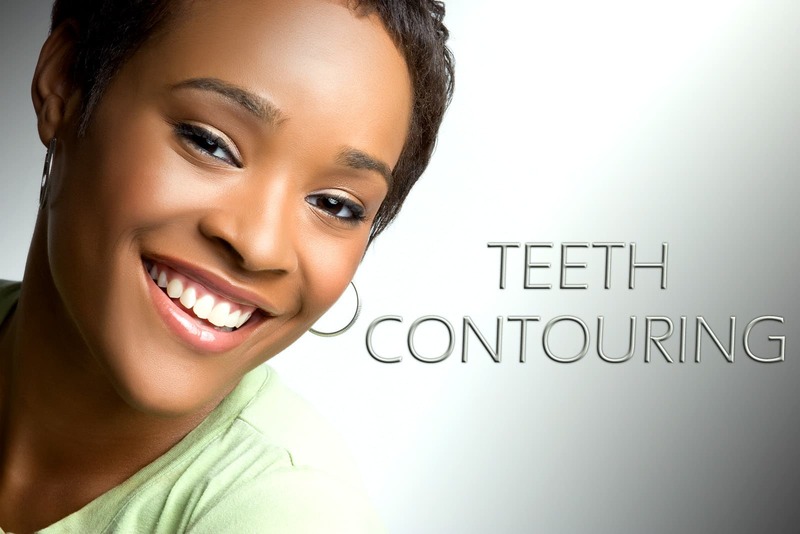 Tooth contouring and reshaping can boost confidence while providing a healthier mouth and a self-assured smile. Dental bonding can be performed along with contouring when a tooth requires more work than contouring will allow. Contouring and bonding are two of the most popular cosmetic dentistry options since they are not time-consuming and are more affordable than other treatments.